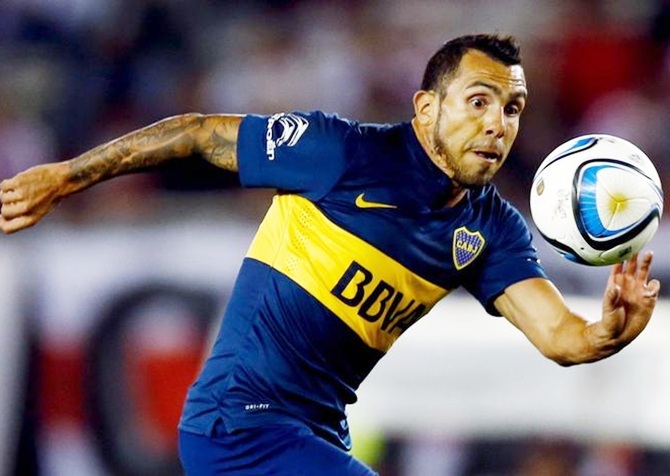 Carlos Tevez scored twice for Boca Juniors on Saturday but the main talking point from their 3-1 win over Argentinos Juniors in a stormy Argentine league game was his studs-up challenge that left defender Ezequiel Ham with a broken ankle. Boca's win was overshadowed by the incident in the 76th minute where Tevez and Ham both went for a loose ball. Television replays showed Tevez going in with his foot raised and slamming it into Ham's ankle, leaving the Argentinos defender writhing in agony. Ham suffered an "exposed fracture of the right ankle" and would require surgery, his club said. Tevez, who last season was top scorer for Italian side Juventus as they won Serie A and reached the Champions League final, was not sanctioned for the incident. "I went for the ball, I didn't have bad intentions," he said in a television interview. "I'm sad because I didn't want to hurt the lad, I've never hurt anyone playing football, this is the first time. "I'm going to visit him and apologise." Argentinos coach Nestor Gorosito did not accept Tevez's version of events. "It wasn't unintentional," he told the club's website. "We were three metres from the incident and you could see it ... Those who have played football know these things." The first half ended in controversy with Argentinos' Andres Franzoia having a goal disallowed and Tevez then putting Boca ahead almost immediately. Players surrounded the referee as they left the field and Argentinos forward Reinaldo Lenis was sent off after clashing with Boca's Nicolas Lodeiro. Tevez scored again the 53rd minute before Ham pulled one back for the home side three minutes later. Jonathan Calleri made it 3-1 just before the final whistle to seal the win for Boca, who lead the 30-team table with 55 points from 25 games and are five clear of San Lorenzo. Cristian Rodriguez scored in the last minute goal to give fourth-placed Independiente a 2-1 win over Nueva Chicago in another of Saturday's games.